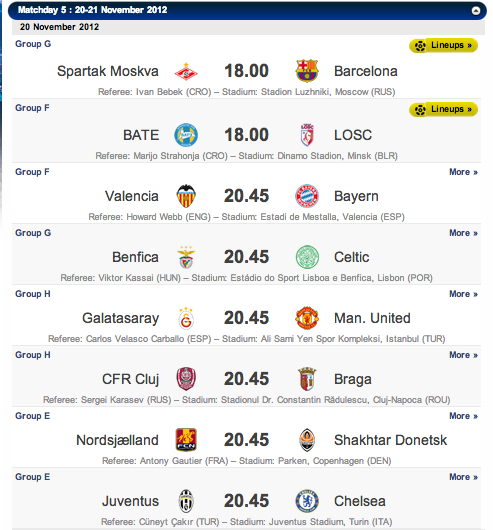 Spartak-Barcelona and BATE-Lille are already underway, in Moscow and Minsk respectively. The other six matches kickoff at the usual 2:45pmET. The MOTDs are Valencia-Bayern at the Mestalla (tied atop Group F with 9 points apiece), and Juventus-Chelsea in Turin. Chelsea pulled even with Shakhtar Donetsk at the top of the group, with 7 points each (click here for all the group standings), thanks only to that last-touch headed goal by Victor Moses at Stamford Bridge two weeks ago. On the other side, calcio’s Chuck Norris will be looking to school Chelsea with another master class today from his position deep in the Juve midfield. Indeed, a good portion of the CultFootball brain trust will be meeting in midtown Manhattan this afternoon for Juve-Chelsea, with an eye on Valencia-Bayern if the viewing venue so allows. God we love Champions League.